Daphne promises Rachel she won't ring her parents. Danny muses about leaving home so Richard Morrison can have Maria to himself. Max is upset that Jim has "stolen" Amy off him. Rachel immediately thinks that Daphne has rung her father, but she insists she didn't. Rachel's father says angrily that he's had to fly back from Hong Kong to look for Rachel. He shouts at Rachel for being childish. She stomps off to bed. Rachel's father thinks Rachel is impossible, but Daphne tells him off and says he's handling things very badly. Daphne stomps off to bed too! Danny has stayed over at the Robinsons while Maria is away with Richard. Julie says that Maria is making a new life for herself now that her family is growing up and leaving. 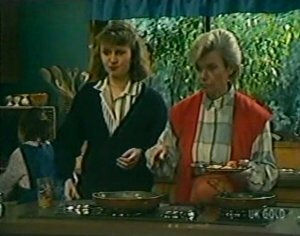 Helen sends Lucy out to feed Basil. She's still insisting on not inviting Gwen. Jim says it's been a long time now - maybe they should forgive and forget. But Helen doesn't want to - Gwen didn't even turn up when Bill or Anne died. 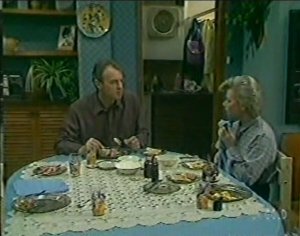 Ian tells Daphne that she's just a tenant, but Daphne says his problems were forced on her. She says she can explain all about Rachel and her motives. He agrees to listen to her. Daphne says that Rachel's main problem is her parents - she's very unhappy living with her mother and her stepdad - she hates him. Daphne says Rachel has no reason to accept the stepdad - these things aren't automatic and she needs help. She tells Ian off for putting work first before Rachel. Danny and Scott are off to school. 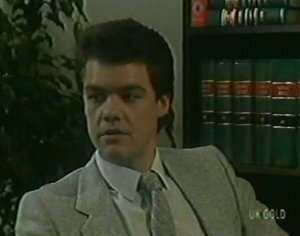 Danny is still bitter about Maria going away with Richard. He says that Scott felt the same about Amy and Scott doesn't like this very much. Rachel's father has gone out. Rachel and Daphne have a chat about the situation. Daphne says she doesn't have all the answers, but she'll try to help her sort things out with her parents. Rachel says she's not used to people meaning what they say. Ian is back and says he hasn't got a lot of time before he leaves. Daphne says it's little wonder that Rachel feels that her father doesn't want her. He says he does want her, but children always go with their mother when it goes to court, so it was pointless fighting it. Daphne thinks he should tell Rachel that. When Rachel comes back, Ian asks Rachel to spend the day with him. She coolly agrees. He heads out to do some work and says he'll see her tonight. When he's gone, Rachel fumes that Ian is just trying to keep her sweet. Daphne says that at least he's trying - there's two sides to every story. Max is still adding to his list of grievances(!) Then he leaves the flat and switches off the light. Scott apologises to Jim about his behaviour towards him and Amy. Jim accepts his apology and says that Scott has no need to feel threatened. Jim is reading out some of Max's grievances to Helen. Some of them go back thirty years(!). One is that Max wants any parts that are left of a rusting car he and Jim bought together in their teens. Jim says that if Max wants everything in the open, he'll do the same! He stomps off to make his own list! HELEN: Max. I think they've both gone mad. She shows Paul Max's list. Terry and Des are cleaning up when Paul comes in. He's got two days off before the wedding. 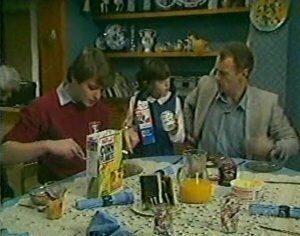 Paul asks Des if he'll get another housemate after Terry leaves. Des isn't even sure that he wants to keep the house at all. 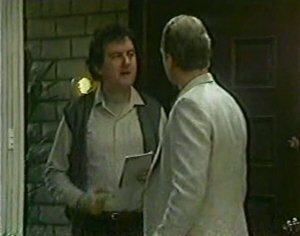 Paul tells Des about Max's list. Jim complains about Julie's hair-washing marathon using up all the hot water. He's clearly still in a strop about Max. Paul comes in and tells them that he and Terry are signing for the unit this afternoon. Daphne answers the phone to someone called Frank. He asks her to do a show for him, but she tells him she doesn't want to. She agrees to think about it though, since he's in a hole. Daphne writes down his new address. Daphne explains to Rachel that she doesn't want the work at the moment. 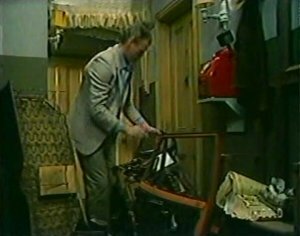 Jim is putting some old car parts into his car - then he drives round to Max's bedsit and leaves them all outside his door with a note! Ian tells Daphne that he has to call off his trip with Rachel because of work. Daphne isn't impressed. She says she'd better move out as soon as she can if Ian wants the house back. Rachel overhears this and looks stricken. Terry tells Paul that she feels a bit nervous about signing - it's their first home. Paul says they'll be drinking champagne soon and celebrating. Rachel writes a note and quickly hides it from Daphne when she comes in. Daphne asks if Rachel is upset about missing the outing with her Dad. She says she isn't. When Daphne has left the house to go into town, Rachel leaves the house with a bag. Paul and Terry have been waiting ages, but are eventually shown in. He tells them there's been a bit of a hitch - in fact, it looks like they've got a major problem.